Ireland U20 and the Ireland women's team are both in action away to Scotland tonight. Follow the two games in our match tracker. The dust has settled on the Ireland women's miserable home World Cup and as the IRFU currently wade their way through the review process, the search for a new head coach goes on. World Rugby confirmed on Tuesday that the 2017 Women's Rugby World Cup set new records for attendance, broadcasting and social and digital media engagement. Tom Tierney confirmed the inevitable after the conclusion of Ireland's disastrous home World Cup, and stepped down as head coach of the women's team after three years in charge. Tom Tierney confirmed the inevitable after the conclusion of Ireland’s disastrous home World Cup, and stepped down as head coach of the women’s team after three years in charge. Ireland will have representation in tomorrow's World Cup final as former international Joy Neville has been selected to take charge of the clash between England and New Zealand. Ireland will meet Wales in a seventh place play-off on Saturday before they can put their miserable World Cup campaign to bed. Tom Tierney refused to speculate on his future after another setback for Ireland at this World Cup against Australia, but accepted his side have "performed poorly" throughout the tournament. Ireland's hopes of contesting the fifth place play-off at the Women's Rugby World Cup were ended by a 36-24 defeat to Australia in Belfast. Tom Tierney will be hoping his charges can defeat Australia for the second time in the tournament at Kingspan Stadium (kick-off 2pm). 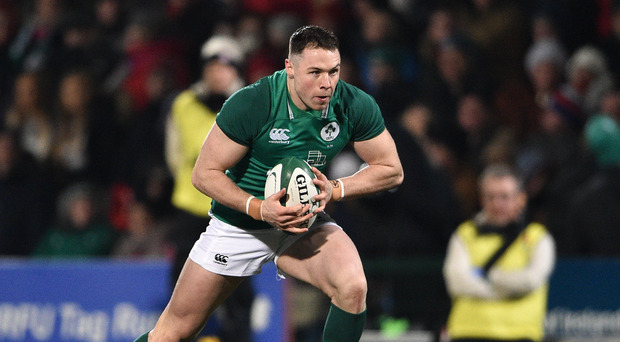 The Kingspan Stadium will host three World Cup games today, yet Ireland find themselves playing in the one that no one wants to be involved in. Jackie Crosbie's eyes filled with tears. Her daughter Katie Fitzhenry was just hours away from playing against France in the Women's Rugby World Cup. It was a must-win game, more than a big deal. As the Women's Rugby World Cup heads to Belfast for the knock-out stages it is tempting to view this as an end to the phoney war, that the battle is only just about to commence. The Ireland women's team currently find themselves in a tricky position. Ireland coach Tom Tierney was left to count the cost of another slow start as France crushed the hosts' World Cup dream. Canada were the latest team to feel the wrath of New Zealand as the Black Ferns demolished the third-ranked team in the world to cement their place as top seeds heading into the semi-final. Three first half tries for France were enough to see off Ireland's challenge. New Zealand powered into the Women's World Cup semi-finals after crushing Canada 48-5 in Dublin to finish top of Pool A. Beaten finalists in 2014, Canada face a massive task if they are to avoid an early exit from the World Cup, writes Cian Tracey. Ireland centre Jenny Murphy has sounded a rallying cry ahead of her side's World Cup pool decider against France this evening. Tom Tierney has finally selected his strongest team for tonight's game and they need to really front up now to stop this marauding French side. Considering the tricky situations Ireland have found themselves in during their opening two World Cup games, the sense of calm that is exuding from the squad is quite remarkable. Ireland have three days to right the many wrongs of their first two disjointed wins but ultimately they go into Thursday's pool decider against France with everything still to play for. Ireland rally after bumpy start to make it two from two... now bring on the French! "That wasn't particularly pretty," Killian Byrne (44) said as he left the UCD Bowl. "But a win is a win - roll on France on Thursday." This Ireland team don't tend to make things easy for themselves but even by their own standards, this was far too close for comfort. Ireland aim to make it two from two when they take on Japan at the UCD Bowl (5.15). Back in late 2013, when Hannah Tyrrell decided to give up her inter-county footballing career with Dublin, her focus shifted towards qualifying for the Olympics with the Ireland Sevens team. Ireland coached Tom Tierney hailed the character of his side after they got their World Cup campaign off to a winning start with a gritty 19-17 win over Australia last night. England laid out a big statement of intent with a 10-try, 56-5 demolition of Spain to launch their Women's Rugby World Cup title defence. It says a lot about the strength in depth of the Ireland squad that Tom Tierney can leave a former World Player of the Year nominee on the bench. Eddie O'Sullivan has warned the Ireland women's team that there is no margin for error in what is a tricky World Cup pool, but he believes that there is enough quality in their squad to advance to at least the semi-final.